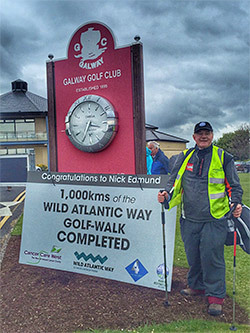 Asia is now in the sights of former Faldo Design Managing Director Nick Edmund after he successfully completed the first 1,000km of his epic cancer charity awareness walk along the length of Ireland’s spectacular Wild Atlantic Way. The golf industry veteran has been on the road for two months after setting off on 4 March from Ireland’s most northerly point, Malin Head, walking with a golf bag on his back and stopping off at golf clubs along the way to play the 4th hole at each one. He arrived at Galway Golf Club at the weekend to a hero’s welcome from friends and supporters, completing the first half of his mission when he sank his putt on the course’s fourth green. It marked 56 days of walking for the 56-year-old, who is taking a break from trekking the route over the summer – to protect himself from the sun, and avoid tourist traffic, as he is in remission from skin, head and neck cancer – before tackling the remaining 1,000km on 4 September, when he sets off again from Galway Golf Club to finish at the Old Head of Kinsale on 1 November. However, Nick won’t be putting his feet up just yet. Having stayed on for a few days’ rest and relaxation in Ireland with his wife, Teresa, who joined him to celebrate their 30th wedding anniversary the day after finishing his walk, Nick is flying out to Vietnam this weekend to attend the Asia Golf Tourism Convention being staged by IAGTO in Danang next week. IAGTO is supporting Nick’s Ireland trek as an official sponsor, and Nick will launch his Global-Golf4-Cancer awareness-building and fundraising campaign in Asia at AGTC, as part of a plan to take it around the world. Once he returns from Vietnam, Nick plans to head back to Ireland to visit the remaining golf courses he will be stopping off at on the second part of his Wild Atlantic Way marathon walk, as well as those where he has already played the 4th hole. He will be delivering the Global-Golf4-Cancer flag so that clubs can fly it for four months from 4 June. He hopes that as many as 44 clubs will fly the flag over the summer. Nick’s eventual aim is for golf clubs across the world to support the organisation’s efforts and fly the flag at various times to help boost the profile of their own local cancer charities, as well as to inspire the golf community generally. After completing the first part of his amazing Wild Atlantic Way hike – which he began just weeks after undergoing a hip replacement operation – Nick says that he is feeling a number of emotions, the most overriding one being that it has felt like a Churchillian effort. He also admits the last two weeks have been extremely tough, with him having to walk every day without a break to reach Galway Golf Club, but he adds that finishing the first part of the walk there was a great feeling. Among those welcoming him at the finish line were members of Cancer Care West, the west of Ireland charity he has been raising awareness for, along with the Irish tourist office, Failte Ireland, North & West Coast Links Golf Ireland, who have been helping to liaise with local golf clubs, and members of Galway Golf Club. Of his physical shape, Nick says he still walks with a limp but it is far better than it was. He has also only suffered two blisters during the entire eight weeks on the road. Saluting Nick’s success, IAGTO Chief Executive Peter Walton says: “The concept of Global-Golf4-Cancer is tremendous and Nick has now made it come alive by completing the arduous first leg down the Wild Atlantic Way, something that could not remotely be taken for granted particularly with a new hip! Nick has been documenting his progress along Ireland’s Wild Atlantic Way in a blog on the Global-Golf4-Cancer website – globalgolf4cancer.org – while his exploits, including the second part of the walk, can also be followed on Twitter and Instagram at GG4Cancer. Global-Golf4-Cancer is a globally active not-for-profit organisation that encourages golfers, and the golf community generally, to participate in awareness campaigns and fundraising events for the benefit of cancer sufferers worldwide. The organisation was founded by golf consultant and former Faldo Design Managing Director Nick Edmund with a particular focus to help locally-based cancer charities. He is walking the entire 2,000km length of Ireland’s Wild Atlantic Way carrying a set of golf clubs to raise awareness and funds for the west of Ireland charity, Cancer Care West.